A disturbance at her neighbor's house piques Eilida's curiosity. What she discovers is so shocking it sends her running through the mountainous woods during a thunderstorm. She slips on the wet ground, plummets down Mount Wilde, and slams into a large boulder beside River Freedom. Eilida is transported to Lyden, where Sunshine, a receptionist at the local paper becomes engrossed in her story. The further Sunshine delves into Eilida's life, the more entangled their lives become. Paranormal events, frightening dreams, and terror-filled memories draw the women together into an unthinkable web of horror. Very creepy and very unpredictable! I tried to unravel the story as I went along but couldn't. It kept me on the edge of my seat as I listened tying to piece it all together. Excellent story and great narration! Looking forward to he rest of the series! I have to admit that this book was a slow start for me. I almost gave up at one stage because I felt a little lost as to what was happening, but then there was the "ah ha" moment and it clicked!! I figured some things out, (though I wasn't right where I thought the plot was going! ), and bam, the book took off. It was awesome!!! I'm not going to summarise the plot because it is much better for you to go into it blind and because I could spoil something easily, so all I'll say is that it's a psychological thriller that brings it's A game! You think you know what is going to happen, but let me tell you that you don't!! There were times when I was reading and I was thinking to myself... what is going on here, but then the author throws a curve ball and it's like a light bulb going off!! The characters were all well written too, though I did find myself confused at times between Eilida and Sunshine and who was doing what! But that was the fun of the plot!!! It made me think and kept me on my toes. In all, this was quite the surprise to me. I haven't heard of this before and didn't know what to think going into it! What I got was a well written thriller that kept me hooked till the very end. I can't wait to see what happens next. Belle Burkhart read this well. Her tones and cadences were really good and she was able to draw me in. She had plenty of tones and voices for the characters and was clear and concise. I thoroughly enjoyed her performance. What was one of the most memorable moments of Eye of the Storm: Eilida's Tragedy? I received this copy for an honest review. I am quite a wide read woman, and I like to think I’ve seen most and now am learning to hear most. AudioBooks are a new way for me to read. And I really enjoy listening while I’m driving. I was not totally sold on the narrator here, I thought she read far too young for the character Elida and Sunshine. I know that Sunshine is supposed to be innocent, and young in mind, but she holds a good job, has a nice boyfriend who proposes. But, the whole… happy and go lucky for this character was a little over the top for me. I couldn’t relate with her at all because of this and the overtly young narrator for it. I did however not mind Elida as a character (even though she too sounded much younger than I honestly think she should have). She had flaws and of course is the reason for all the psychological storyline. There are lots of questions. All in all, the story had many twists and turns, and although the beginning with the proposal wasn’t quite for me. I do think listening to the story in full is essential. The author does bring the elements of thriller, psychological in much more towards the end. And it’s more enjoyable. Just takes a good amount of time to get into. There are some awkward phrasings, and use of crutch words, but I can forgive those because the ending is worth it. Thank you for allowing me to review for you. This is a good Psychological Thriller written in the paranormal category but is more a horror. The book is well written and the plot is bizarre, but something was missing for me in the excitement area. This is my first read by the author, Elle Klass. It is an enjoyable story, however, I didn't care for the narrator, Belle Burkhart. To me it sounded like a little girl was reading it. She delivered the story well enough, just the little girl voice was off for me. I did like the poem at the beginning of the story - very clever! This audio book was gifted to me from a book event contest. My review is based on the audio book. I had the awesome experience to listen to the audio book. The narrator did a fantastic job. Her voice was soothing and tone changed between the characters flawlessly. Overall I really enjoyed my audio experience and I would recommend it to anyone who enjoys a good suspense. My jaw is still on the ground after listening to this book. I was impressed with the story. It listens fast and keeps you engaged the entire time. I liked the characters. I found them to be believable and connected to them. My favorite part was the ending because it was completely unexpected. My mouth hurts because my jaw dropped so low for so long. It was amazing. I really enjoyed this and plan on sharing it with my suspense loving friends. 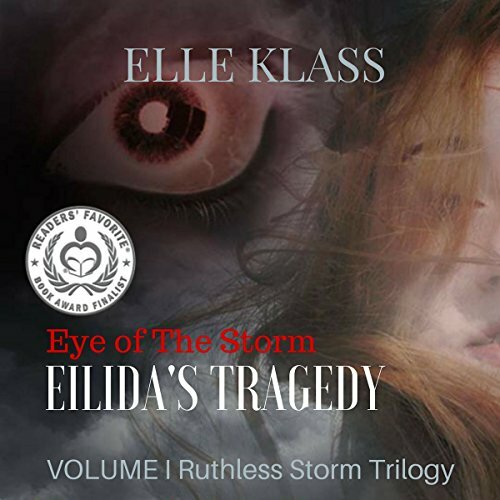 What did you love best about Eye of the Storm: Eilida's Tragedy? Sunshine is the epitome of her name. Her life is perfect—from her job at the local newspaper despite a few annoying co-workers to her wealthy boyfriend who is days from proposing—and full of sunshine until a “Jane Doe” shows up at the local hospital and sends her life into a tailspin. Not only does the woman’s appearance become the main focus of the newspaper, but she become Sunshine’s. Feeling attached to the woman somehow, Sunshine sets out to find out who she is and what happened to her. In her pursuit to find out all she can about this woman, Sunshine begins to suffer memory loss, hallucinations, and dreams of a life she didn’t live. Her connection to Eilida, the woman in the hospital, becomes apparent, but the how they are related remains a mystery to Sunshine. Things happen in the novel that seemingly don’t make sense, like how can Eilida’s boyfriend not know she is in the hospital when Eilida’s roommate, parents, and school all know, and they frustrated me at first because I honestly thought they were holes in the plot. I was wrong, boy was I wrong. Okay, so if I say much more, I’ll be giving too much away, and you have to read this for yourself to find out the big twist ending. Oh, I forgot to mention that I listened to the audio version of this novella (a complimentary copy from the author in exchange for an honest review), and the narrator made a perfect Sunshine. At first I thought she sounded too young, but once I got to know Sunshine and just how sweet and innocent she is, I knew the narrator was perfect for her. First of all, I read this as an ebook and thought that it was absolutely amazing. Elle Klass weaved a wonderful and masterful paranormal tale that begins with “Twas the Night Before Death.” As a book with her writings alone, I could see exactly what she was trying to say, every nuance, every setting, etc..
Now, add narrator Belle Burkhart’s voice onto a substantial story filled with intrigue and you’ve got yourself an audiobook that you’ll want to play over and over again, finding something new each time to capture you in suspense and never let you go. Belle Burkhart has a nice normal voice but she was monotone, with little to no difference in voices. Male voices are really hard for most females and I automatically have a great deal of forgiveness for any female narrator given that fact; however, there was just no change in tone or inflection from character to character. I couldn’t easily identify who was who during my listen. I cannot speak to editing, spelling or punctuation errors in the physical text, but for the audio version there are no really noticeable chapter breaks. From time to time I would notice that a character’s name was oddly, plainly stated for no other reason than, I can only assume, the beginning of a new chapter. I found the book to be eye rollingly over descriptive. The plot gets lost and the storyline is muddled by the description of every nuance, from the way a person looked to exactly what was on the wedding rehearsal dinner menu. There was redundant and misuse of words like “intuitively” and “macabre”. Overall, the plot very predictable, the book felt immature and unrealistic, like it was not written with much research or thought. Why would a seasoned detective give a young substitute reporter on her first “story” a physical tour of an unsolved crime scene? Some other blaring things that bothered me are - you don’t “pop a cork of merlot” and there is no such thing as “heart pressure medicine,” at least not in the google search I did to research this. The protagonist gets drunk so much logic would argue that her “perfect” fiancées perfect parents would likely not be so supportive of the marriage – or at least would worry about their son. Even a work of fiction should be well thought out and edited. I was left wondering why the book was written except to be book one of a series. What was the message? What was the writer trying to convey to me, the reader? As a proud and true book worm (I go through 10-30 stories a week between physical texts, Kindle and Audible versions) I find it offensive when a writer seems to write a book just to fill up or round out a trilogy. While I applaud and appreciate the work of all writer go through I must say I did not enjoy this book. I encourage the writer to keep writing, learning and fully research her thoughts and ideas. Yeah, it was great till the end, which felt rushed and unsatisfactory. Would you be willing to try another book from Elle Klass? Why or why not? Yeah I want to find out what happened to the characters from this book. It says it's a trilogy. I hope it continues with this storyline. What does Belle Burkhart bring to the story that you wouldn’t experience if you just read the book? I can see people being annoyed by her voice. Its super high-pitched and annoyingly cheery, but it was perfect for Sunshine. I would never have attached quite that pitch to her character but I think Belle Burkhart did a great job. Was Eye of the Storm: Eilida's Tragedy worth the listening time? Yes, again until the end. For me at least.